If you’ve been injured in a car accident, you might be wondering whether a personal injury attorney will even take your case and represent you. Some people believe that personal injury lawyers only take very serious injury cases and that if you’re just feeling some neck and back pain, you won’t be able to find an attorney. While it is true that some personal injury attorneys only take on very serious injury cases, there are many personal injury lawyers that help people who are experiencing minor to moderate pain after a car accident. In assessing whether to take a case or not, lawyers analyze the following three issues: liability, damage, and insurance coverage. The presence and degree of all three factors will play an important role in determining whether a personal injury lawyer will take your case. The clearer each issue is in your favor, the more likely an attorney will take your case. 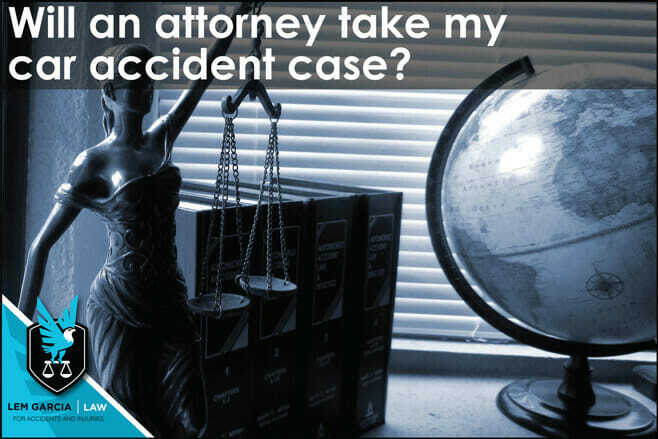 If liability is an issue, the less likely an attorney will take your case. If there is little to no damage (injury) to you, the less likely an attorney will take your case. If there is no insurance coverage, the less likely an attorney will take your case. But if it is clear that you weren’t liable for the crash, that you are not feeling well because of the crash, and that there is insurance coverage to pay for the damages that were caused, it is very likely that an attorney will take your case. If you’ve been involved in a car accident, it is very important that you speak to an experienced personal injury attorney right away to help assess how strong your case is. If you attempt to handle your case on your own, you will be up against an insurance company that handles car accident cases all day – and they are only looking out for their best interests. West Covina car accident lawyer, Lem Garcia, helps people who have been injured in car accidents and provides free case reviews. If you’ve been injured in a car crash, give us a call anytime. We are here to help.